A new financial rewards site named SaveUp is starting Beta today. SaveUp gives people rewards for saving money and beating down their debts. You can use this link to sign up for the beta and get 100 free bonus credits. I was able to check out SaveUp in a limited early test run. Its easy to get setup and the site is simple to use. You can gain credits through several ways. You get a certain amount of credits for connecting SaveUp to a savings account or credit card account. You can get more credits by meeting certain challenges or by doing things like watching educational videos. One challenge presented was to not use my credit card for two days. Watching a 2 minute educational video will get you credits too. All of the various ways you get credits help you facilitate or build on your saving. 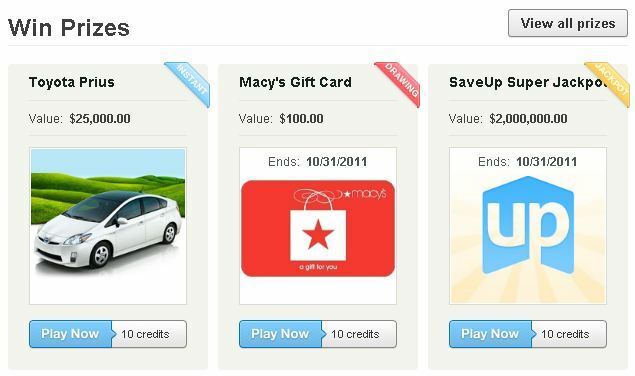 There are three ways to play for prizes on SaveUp. You can do an instant win, a raffle or the jackpot lottery. Instant play is kind of like a scratch off lottery ticket or a game of Keno. The instant play prizes can be big items like a new car or an expensive vacation. You pull a random number and see if your digits match the winning number. If you get enough matching numbers then you can win a prize. The game is played instantly. The instant games have a grand prize if you match all the digits or smaller value prizes for matching only some digits. For example, matching 6 out of 10 digits might win you a $25 value prize and matching only 2 out of 10 digits would get you 5 of the SaveUp credits. The Raffle games work like any other raffle. You spend your credit to get a raffle ticket. Then periodically the drawing is held and a winner announced. Typical prizes are $100 gift cards or things like a iPad valued at $500. They have various major merchants like Macy's. Jackpot play is like getting a lottery ticket for the power ball. The chances of winning are low but the prize is huge. They have a $2,000,000 jackpot prize. I've mentioned before that I actually enjoy playing the lottery. I think its a fun way to fantasize about what you'd do if you won the millions. Of course I don't expect to win and its not part of my retirement planning. Playing the SaveUp jackpot is a free way to satisfy my lottery enjoyment. The only 'negative' I could come up with personally is that they limit the number of times you get to play each day. So you can only enter drawings, lotteries or do an instant win game a certain limited number of times. I would have liked more plays in a given day. But this setup has merits since it keeps you coming back more often to get your daily plays. The fact that I wanted to play more is not really a bad thing. I would certainly recommend SaveUp. Its FREE and it certainly doesn't hurt to play free raffles or enter a free lottery game. I think SaveUp can help incentivize some people to save more. Thats its overall goal and I like the idea. Bottom Line : SaveUp is an innovative new free program where users can win prizes and help encourage their personal savings habits. Where Do Universities Spend their Money? Where Do Universities Get their Money From?